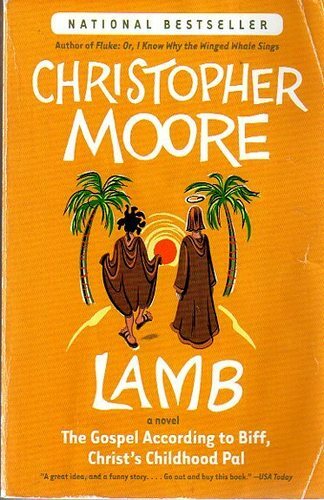 I’ve been reading Christopher Moore’s excellent book Lamb. It offers a light-hearted but surprisingly respectful “alternative Gospel” about the early life of Jesus. The story is told by Biff, Jesus’ boyhood best friend. On the orders of the Most High, the archangel Raziel resurrects Biff in the present day (2010) to write the new Gospel. The two of them live in a hotel room in New York while Biff writes about his experiences with Jesus. The Gospel narrative is interspersed with scenes in the present day, as when (a) Biff finds a Bible in the hotel room and tries to read parts of it without letting Raziel find out, and (b) Raziel becomes obsessed with TV soap operas but doesn’t realize they are fictional. The idea of telling about Jesus’ boyhood is not a new one. One of the Gospels that did not make it into the Christian canon was the Infancy Gospel of Thomas, which recounts stories about the childhood years of Jesus. The Infancy Gospel of Thomas has Jesus striking his playmates dead on at least one occasion, but Biff’s Gospel in Lamb paints a kinder, gentler picture of Jesus that is more in keeping with our traditional view of him. Apart from recommending the book to anyone except those who would find any non-canonical Gospel offensive, I’d like to make two points of interest. First, you might have noticed that I wrote “Jesus’ boyhood.” According to the authoritative writing manual The Elements of Style by Willard Strunk & E.B. White — a book that writers regard as a “Gospel” of correct English — the normal rule is to form singular possessives by adding apostrophe-s. That applies even to words ending in the letter ‘s’. Thus, for example, you’d normally write “James’s brother” instead of “James’ brother,” the latter of which is incorrect. But there’s one exception, and only one: when you form the possessive of “Jesus,” referring to the Biblical Jesus, you only add an apostrophe. No ‘s’. All right, it’s not earth-shaking, but it is interesting. It’s a linguistic remnant of the culture in which we used to live, which in the last 70 years has been bulldozed and plowed under by Goldman Sachs and Wal-Mart and Britney Spears and Halliburton. Even in punctuation, the name of Jesus got special treatment. Besides singular and plural, Hebrew also has a “dual” ending that refers only to pairs of things, such as hands or eyes. I don’t recall if there’s a dual ending that applies to two angels, but there might be. Angels are an interesting topic in themselves. If you believe in them, then their interest is theological; if you think they’re mythical, then their interest is cultural and psychological. The Thomist philosopher Mortimer J. Adler, who was editor of The Encyclopedia Britannica for many years, wrote a good book about The Angels and Us. When I was actively searching several years ago, I picked up quite a lot of instructive books. Oddly enough a lot of was Anglican; if I had it to do over again that’s probably where I’d go (or the United Church). One book I was keen to get hold of was a book called God In Search of Man by Abraham Joshua Heschel. I actually ordered it to be delivered to a big bookstore in midtown. It was a pain to get to, and when I got there, oops! They’d sold it to someone else. I wasn’t out anything but the time and trouble, but it was a real bitter pill for some reason. I think it was the last religious advocacy book I reached out for. Now I’m inclined to see about ordering it online just to see what I missed out on back then. Sorry that you had a problem with the bookstore! I’ve got that book and it’s excellent. Heschel was a great thinker and a very wise man. In fact, one of my ex’s sons is named after him. Back in the day, if I wanted books from Germany or Austria, I had to buy (or order) them through the Mary S. Rosenberg Bookstore in New York. Now, it’s as easy as going to Amazon.de on the Web. For most current American books, I can simply order on and download to my Nook eBook reader. But one clarification: “Lamb” is not a religious advocacy book. It’s more the Douglas Adams “Hitchhiker’s Guide to the Galaxy” version of a New Testament Gospel. It’s respectful but I wouldn’t call it reverent. It is quite funny in places, such as when Jesus discovers the buzz he gets from coffee.